Many wearers couldn’t give the Elbrus GV high enough praises for its impressive level of comfort. Less than a handful of reviewers regarded the boot’s overall workmanship as truly superb. Some owners greatly appreciated the Asolo Elbrus GV for its reliable ankle support. A gear-centric review website applauded the footwear’s surprising lightness. Based on a couple of reports, this Asolo boot fits well. A small minority raved about the Elbrus GV’s awe-inspiring design. A footwear critic thought that he got his money’s worth purchasing this climbing footgear. This boot was disliked by a professional reviewer due to its hit-or-miss stability on rockier terrain. The Asolo Elbrus GV is a remarkably crafted gear loved by mountaineers for its jaw-dropping comfort, true-to-size fit and supportive arch zone. Its only bane, however, is its instability on considerably rugged surfaces. Despite the lone misstep pointed out by an outdoor footwear expert, the Asolo Elbrus GV proudly flies high thanks to its neat collection of convincing qualities. 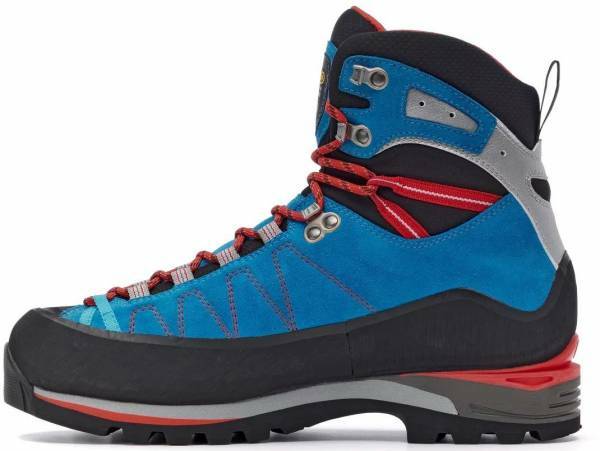 Unless you need the absolute best performance, then this is a superbly priced boot for general winter mountain use, which is very difficult to improve upon. The Elbrus GV from Asolo is an over-the-ankle mountaineering boot, sporting a lightweight yet protective shell which is made of soft Schoeller textile. This waterproof and breathable upper (thanks to Gore-Tex) is securely nested on a part nylon, part fiberglass lasting board called Asoflex Spiky. For shock absorption and cushioning, the engineers from the Italian brand gave the Elbrus GV a microporous midsole with Dual Integrated System technology. It is engineered with an attach point at the heel, making the boot compatible with semi-automatic (hybrid) crampons. Beneath this chunky platform is the Vibram Ascent outsole for traction. Asolo’s Elbrus GV is a fairly true-to-size, high-cut alpine climbing gear for men and women. It is specifically crafted for individuals with regular (medium-width) feet. It comes in a range of sizes, both full and half. The women’s version is built around a last that closely follows the contours of the female foot. The boot’s speed lacing system makes lockdown personalization possible. Vibram Ascent is what gives mountaineers the amount of traction they need on rocky terrain. This outsole is engineered with mostly blocky lugs horizontally lined up along its borders for improved climbing control. The forefoot tip of the outsole extends to the upper. This design choice gives wearers frontal protection against bumps. With its dual-density microporous midsole, the Asolo Elbrus GV provides adequate stability, soft cushioning, and terrain protection. Its crampon points are made of polyurethane. Doubling down on underfoot comfort is the Lite 4 anatomic footbed. The Elbrus GV has a water-resistant suede leather upper engineered with soft shell-like coating from Schoeller. Granting the boot a level of water protection is the Gore-Tex Performance Comfort liner imbued within its main bootie. This waterproofing technology also promotes the boot’s breathability. Giving mountaineers a secure lockdown is the Elbrus GV’s speed lacing system. It is made up of synthetic laces and a combination of metallic open hooks and synthetic lace loops.